I meant to post this image a few days ago - but my day job railroaded me and because a day/night job for a few days. So, this is the full picture of the windmill that I showed you in my previous posts. The mill was built in the 1840s. The roof, sails and machinery were removed in the early 20th century and the mill was converted into a horse-mill. Can you imagine how boring it must have been for the horses to walk in a circle all day, grinding flour?! 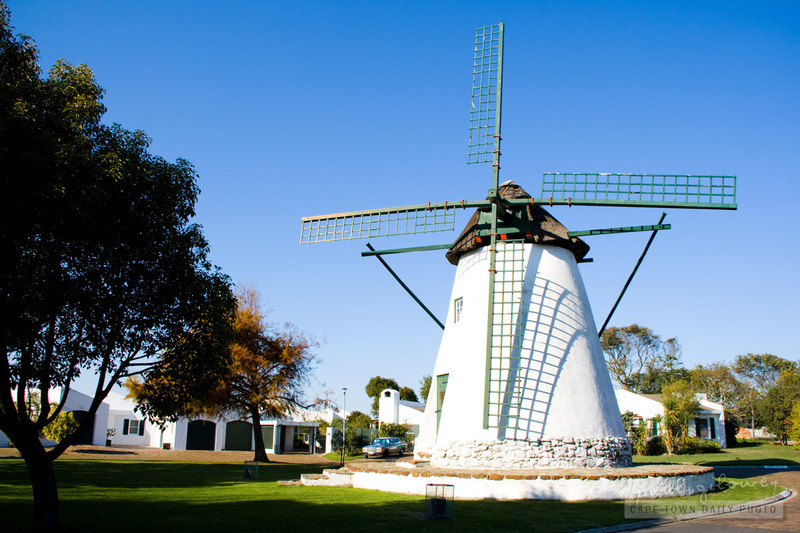 The mill is located in a small, and beautiful, middle-class cluster-housing complex. Isn't it just a great addition to the look and feel of the complex? According to the plaque on the door the mill was restored to its current state in 1984 by the Natal Building Society. Posted in General and tagged buildings, suburbs on Tuesday, 16 August, 2011 by Paul. It’s a gorgeous mill Paul and you captured it beautifully. It’s a great focal point for the housing complex – lucky them!